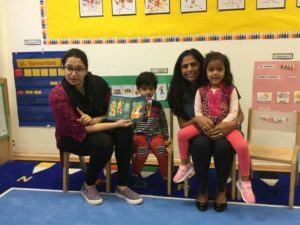 Green Room parents teach the students about the holiday of Diwali by reading a story. Families in our Green (3s), Pre-K (4s), and Junior K (4s/5s) classrooms are invited to visit IPS on occasions of their choosing throughout the school year. During their visit, which can last anywhere from fifteen to thirty minutes, parents are asked to share information with the children about their family’s culture and/or celebrate a special family tradition that they take part in. Many families will choose to celebrate a particular holiday with the students, such as Christmas, Hanukkah, Diwali, or Lunar New Year, to name a few. Parents can conduct an art project, read a story, cook or bake a traditional food, demonstrate a special dance, teach the children how to say a few words in their native language, play music, display photographs…the possibilities are endless! The result of the family culture share is that each child will take something away from the visit about a new culture, adding to his/her sense of international awareness, through play. In addition, school-wide culture share festivities are held at each of our three IPS locations. Earlier in November, the holiday of Diwali was celebrated via a dance performance in the gym; in February, a commemoration of the Lunar New Year will take place. 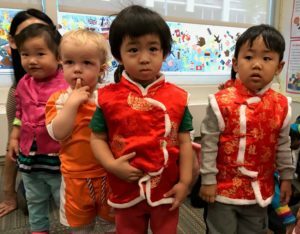 These are just a few of the many celebrations of culture here at The International Preschools. We are looking forward to learning more about each other’s families and traditions over the coming weeks and months! Interested in learning more about The International Preschools? Read our mission statement by clicking here.